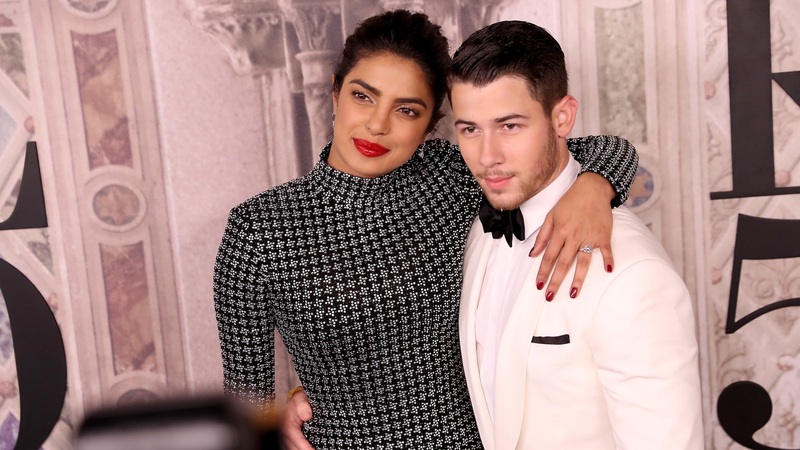 Is it just us, or did Priyanka Chopra and Nick Jonas’ wedding planner hit a warp speed button somewhere along the way? Instagram posts from the pair this week seem to be hinting that something big is about to happen, and that something is likely their nuptials. Not that we’re complaining. Chopra and Jonas are an adorable couple, and we’ve admittedly been living vicariously through their recent posts from Mumbai, India, where they’ve been since at least Thanksgiving. On Thanksgiving, Chopra posted a photo of the couple’s family seated at a massive banquet table. Clearly, something is afoot. In fact, it doesn’t seem unreasonable to consider the possibility that Thanksgiving dinner also doubled as a rehearsal dinner for the couple’s upcoming wedding. Per The Sun, a week of festivities will precede Chopra and Jonas’ ceremony, which is rumored to be happening on Saturday, Dec. 1. The Sun even reportedly knows the color scheme of the wedding, with their source stating Nick will be in ivory while Chopra will rock red. And at this point, there’s nothing to point to The Sun’s information being inaccurate. Their timeline seems to be holding true at the very least. On Nov. 3, Chopra shared photos from her bachelorette weekend. On Nov. 8, the couple secured their marriage license. Could a wedding really be much further? Chopra and Jonas, who were set up by a mutual friend, got engaged on Chopra’s 36th birthday in July.